Little attention is given to loss prevention tips and tricks about how to remove merchandise from packaging damage-free. While more likely to be discussed, proper product storage and handling is an area for improvement as well. Follow these simple loss prevention tips for retail stores to save your business the hefty cost of product that is ruined before it hits the shelves. Retailers lose billions of dollars each year to merchandise damage and destruction. Much of this damage is caused by cutting tools while opening boxes or product packaging. Most inventory arrives in cardboard boxes, and most workers use traditional box cutters to open those boxes. The blade on these tools typically extends about an inch. Most cardboard boxes, however, are made of single- or double-walled corrugated, which is thinner than one inch. This is a recipe for disaster: that dangerously sharp blade can easily cut through your box, and right on through to your merchandise. We know the problem: conventional box cutters expose too much blade, and a dangerously sharp one at that. The solution is just as easy: use Slice box cutters or the Slice Manual Carton Cutter. Slice box cutters are specifically designed to expose only enough blade to get through single- or double-corrugated cardboard, leaving the contents untouched. The unique J-hook design of these tools is ergonomic: it provides a solid grip and a natural, comfortable cutting motion. This helps reduce hand and forearm fatigue, which is especially important for workers who repeatedly open boxes. 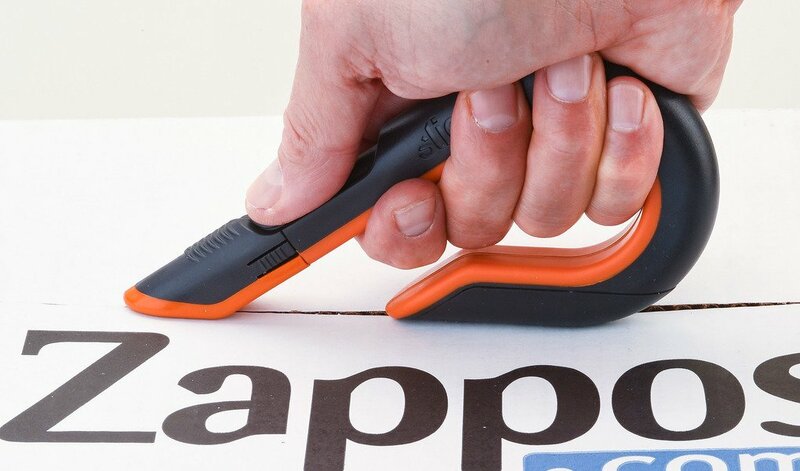 The handle is designed so that the front and back sit flush on the surface of the cardboard while you’re cutting. This provides stability, which, especially when combined with a firm grip, greatly reduces the chances of tool slippage. A solid grip helps you make a clean, controlled cut that doesn’t endanger yourself or those around you. 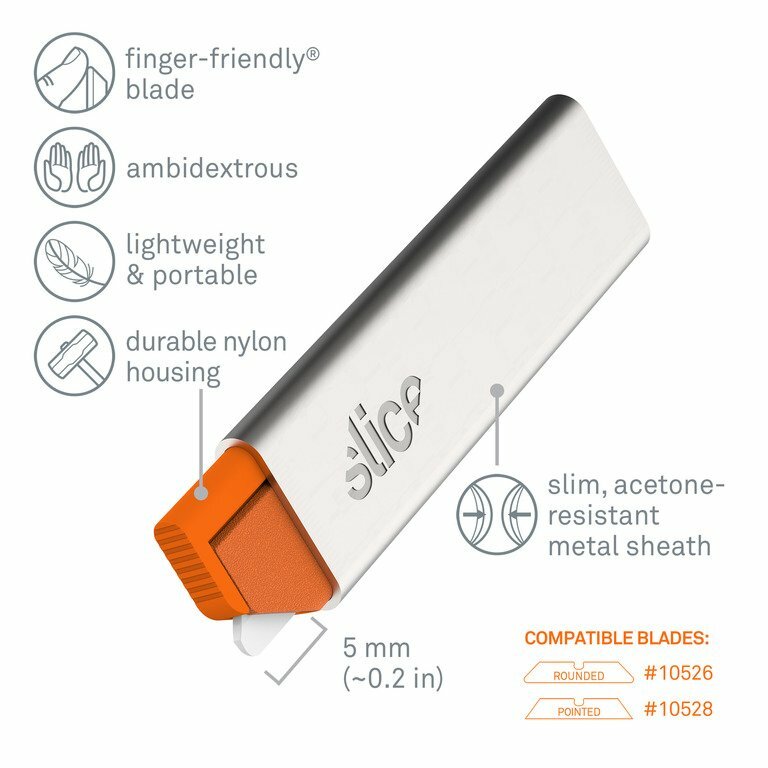 Slice makes two versions of the box cutter: the Manual Box Cutter and Auto-Retractable Box Cutter. Each version has a slider button that the user must engage to expose the blade. The slider on the manual tool fixes the blade in its exposed position. The user must then engage the slider once more to retract the blade back into the handle. The auto-retractable tool requires the user to keep the slider engaged during use to keep the blade exposed. If the user releases the slider, the blade will automatically retract into the handle. The model you choose depends on how frequently you’ll use your tool and the level of safety you require. The Manual Carton Cutter is excellent for getting through single-walled corrugated. Some may also prefer its smaller size: you can easily keep this tool in a shirt or pants pocket. As with all Slice cutting tools, the box and carton cutters feature Slice’s proprietary safety blade: it’s finger friendly® and safe to the touch. Steel is a relatively soft material that dulls quickly. This is why steel blades come overly sharp out of the box. Standard ceramic blades mimic this dangerously sharp grind. Slice blades start at a safe and effective sharpness by design, and stay there much longer. Our 100 percent zirconium blades are durable: they have been shown to last up to 11 times longer than steel blades. When you handle a blade, you run the risk of getting injured, so you should do this as little as possible. However, you must change a dull blade: blades are most dangerous when they’re dull, and when they’re overly sharp (which Slice blades, unlike steel or typical ceramic blades, never are). The longevity and grind of Slice blades means you make fewer blades changes, and the ones you do make are safer. Getting through the box is only step one of the unpacking process. Many items come sealed in their own protective covering, be it a plastic bag, clamshell packaging, or a blister pack. Next on the list of retail loss prevention tips, then, is to find a safe way of getting through this packaging because many products are damaged by cutting tools at this stage, too. The Slice Safety Cutter and Safety Cutter Ring are excellent choices for getting through thinner materials. Both of these tools feature Slice’s unique micro-ceramic blade, with our patent-pending finger-friendly grind. This, combined with the small size of the exposed blade, makes these tools exceptionally safe for you and your merchandise. Do not underestimate the strength of this blade. It might not look strong, but it’s mighty powerful. It can easily cut through tough clamshell packaging, which is so notoriously frustrating to deal with that the associated emotion has been given its own name: wrap rage! These loss prevention ideas for retail do more than contribute to keeping your merchandise safe; they help keep your workforce safer, too. Slice safety blades help reduce lacerations, which can result in huge costs: according to OSHA, a single laceration costs an employer $41,000 on average. Consider, too, that during times when business spikes, like the holiday season, many of the workers unpacking merchandise are temporary seasonal employees. New workers, especially those under the intense pressure associated with busy seasons, are more likely to suffer an injury like a laceration. Safer cutting tools are especially beneficial in these environments. Before your workforce goes after merchandise packaging with box cutters and safety cutters, you’ll likely hold the boxes in storage. This is another time when the chance for damage is high, but is also completely avoidable, with some forethought and care. Billions of dollars in retail merchandise is lost each year between the time it is received and the time it is on display. Reducing this costly damage is achievable through appropriate cutting tool choices—like those provided by Slice—and through mindful, thoughtful handling and storage. Please let us know if you follow these loss prevention tips and the results you experience. If you’re looking for loss prevention services please contact Fast Guard Service Retail Security.